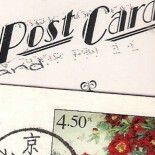 News today that Britain’s oldest postcard publishers J Salmon Ltd will be no more. It comes as no surprise but is no less sad for that. The company started up in 1880 when Joseph Salmon purchased a printing business in Sevenoaks, Kent. Shortly afterwards he published his first postcards, featuring images of the local area and the firm still operate from Sevenoaks to this day with charge now taken by the fifth generation of the family, brothers Charles and Harry. For those of us who still use the postcard the instantly recognisable leaping salmon logo is one of the most iconic of all the motifs, with almost 140 years of service. Salmons have published cards of every British landmark, high street, park and its people… and, just like that, we let them fade into obscurity. Everyone’s family owes them something – even if you didn’t know it, we’ve all had a Salmon postcard in our family at some point or other. On reading the news I popped into my local WHSmith to pick up a few of their (final) designs. The experience was indicative of the lack of enthusiasm for the medium… unable to find them I asked a sales assistant who led me to rack of Salmon cards at the back of the shop, buried behind a monolith of stacked cardboard. I told her it was the end of an era; she smiled, not giving a toss. These were the only postcards in the shop. Will they be replaced, or is this the final bell tolling for the classic tourist postcard itself? Go out tomorrow and buy some Salmon Cameracolour Post Cards. Send them to a friend, a family member, a loved one and know that your ancestors over the last 140 years did the same; and that you are the last. There are still those who love snail mail, and I don’t think it will die. However, it is still sad to hear of the end of a iconic postcard publisher. This entry was posted on September 25, 2017 by Craig in British Postcards, deltiology, New postcards, Postcards, Publisher: J. Salmon Ltd, Uncategorized.